I’m not a welder, at least not in the typical sense of the trade. But my daddy is, by way of 2300 hours of training that certified him, courtesy of the Atlanta Federal penitentiary. I myself couldn’t put a rod in the thingamajig. And heavy equipment makes me nervous. But I do tend to fuse things, confuse things, sometimes with sparks, sometimes like a lava melt, sometimes backed by a tank of compressed air ready to blow, sometimes quiet as a slow leak. The beauty of writing, recording, gigging and the like to me is, when it’s right, it comes together and makes a glow in my soul, so intense it pierces a hot afternoon like a hissing firecracker. “Don’t look at it directly...it’ll burn your eyes!” mama used to yell. I stood bare-footed hanging on the inside of the screen door of our Florida patio. I loved watching the electron-beam of our family business, Cook’s Welding, at work in our tiny dirt yard. It was so hard not to look. Couldn’t help but look. 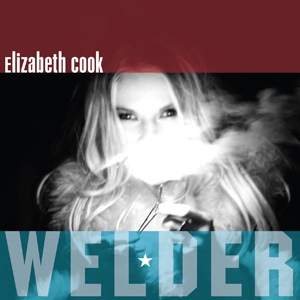 And the rawness of my new album Welder is case and point. Apparently, I still can’t help but look. I’ll never forget going back home there for a class reunion. Because of poor timing, I had the surreal experience of receiving my first major label recording contract via the fax machine at none other than the Wildwood Ace Hardware. It was bizarre. The man behind the counter looked down his glasses at me, completely oblivious to the famous letterhead detailing big dreams and dollars in his hands. He said “You tell your daddy we ain’t had a welder to beat him since he left.” God, I can only hope to get that good. Thankfully, seems my chances are still coming. In the way my career has come together so far in unforeseen ways, via things like my satellite radio show “Apron Strings” on Sirius’ Outlaw Country, the Grand Ole Opry, great places to play and people to play them with, accomplishments in songwriting, acting gigs, my team of Tigers, this kind of mish mash continues. The story melts and bends. Once he quit drinking, Daddy used the overflow of our economy to fund the beginnings of my music career…he bought yards of fringe for cowgirl suits, red boots from The Loretta Lynn gift shop, a public announcement system, including a Peavey mic and two speakers from a music store in Orlando. One time he tried to bribe the house band at Nashville’s Opryland amusement park to let me up on stage to sing a song by flashing a cool twenty. He scuffled away rejected in his white dress shoes. Today I humbly state I’ve logged over 300 appearances on the Opry’s sacred stage... that’s up the sidewalk a ways, in the big house. Mama certainly did her part writing songs, teaching me lyrics she wrote out on poster board, sitting on the bed singing “One Day At A Time Sweet Jesus” after she got the cooler packed and rollers in my hair. A lot has changed. And nothing has gone like we thought it would. But somehow it feels alright. For my fifth all grown up studio album, I’m enjoying the journey more and I see how welding continues to shape my life. This record was really tough to make in some ways and really easy in others. It was a cool breeze and a real high to work with Don Was. Like Rodney Crowell before him, he helps me continue to break out of jail. So I bought him a nice key chain. The eclectic cast of pickers on Welder, not only pros, but friends, united to record at last. We all hung out and worked oblivious to the red light pressure. I barely noticed the days of rain while we recorded. Just a week long party with nice carpet and tiny lights, wires knobs and buttons, a stocked fridge, love and luck all around me, plus one really good coffee pot. I drew in, and struck like lightning. From a material standpoint, I’ve never had more to write about…didn’t have to dig too deep at all. For instance, I never thought I’d be singing about my Mama’s funeral. Just never thought I’d write, much less sing, about that. But here it is on Welder…alongside other tales of the harshness and delicacies of romantic and familial love (“Not California”, “Heroin Addict Sister”, “Girlfriend Tonight”), occasionally indulging in the rush of being inappropriate (“El Camino”, “Snake In The Bed”, “Yes To Booty”). As wild a ride as it is, this is the hand the last three years since release of the Balls album has dealt me. Welder is my way of bringing it all together. And it’s just the truth. Though emotional whiplash is a serious condition, as an artist, I’m grateful for experiences that have grown me up a little bit, even if it hurts like hell. And although I didn’t really want to, the fact that I “couldn’t help but look” is what made Welder possible. It’s my damnation and my salvation. And it’s my job. I have to look. I hope the musical journey on Welder brings the condolences that come with sharing, through commiserating about life, in laughter and in tears, for the old fans, the newly added, and the all around music loving public, to whom I’m so grateful, each and every one. Thanks for looking.